(Photo: © Peter Kenny / Ecumenical News)Dr. Talip Atalay, Mufti of Cyprus (left) and Bishop Porfyrios of Neapolis during a meeting titled "Interreligious Communication, Freedom of Religion and Peace Building" on March 11, 2016 at the United Nations in Geneva. It was a side event during during the 31st sitting of the Human Rights Council. Dialogue between religious leaders of different faiths is sometimes dismissed as like-minded believers cozying up to one another. But in the case of the island of Cyprus the Muslim leader from the Turkish north and the Christian leadership from the Greek south both believe dialogue between the faiths is helping mold reconciliation. Turkey invaded Cyprus in 1974 after a coup aiming at union with Greece and the divided island has become one of the United Nations' longest running disputes. Just how cruciial Cyrpus is as a regional geopolitical entitiy was shown on March 15 when the Cypriot government said it could not consent to the European Union entering a new phase with Turkey in its bid to join the bloc, Reuters news agency reported. It said this would potentially scupper an accord between the EU and Ankara on stemming the influx of refugees into Europe. 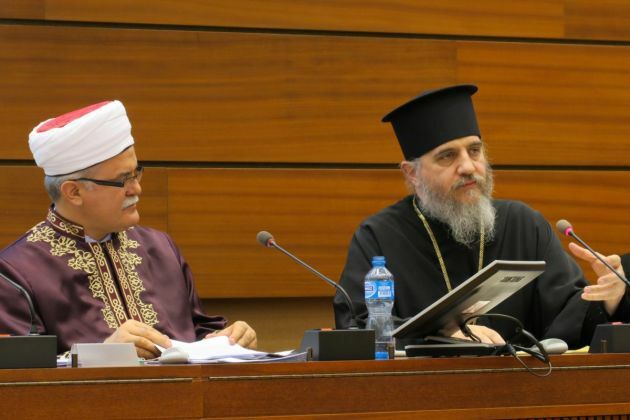 The value of dialogue among religious leaders in Cyrpus goes beyond its shores and can become a model in the conflagration consuming its Middle Eastern neighbors, a Greek Orthodox bishop and a Turkish mufti agreed at a recent meeting held at the United Nations in Geneva. They were speakers at a meeting titled "Interreligious Communication, Freedom of Religion and Peace Building". Hosted by the Sweden's Mission the gathering took place as a side event on March 11 during the 31st sitting of the Human Rights Council. Those interested in a solution to the Cyprus problem soon should support such dialogue however they can said Bishop Porfyrios of Neapolis, director of the Church of Cyprus to the European Institutions in Brussels. "The great value and importance of the dialogue goes beyond the country's shores and can become a model and an example in the conflagration that has consumed our neighbors in the Middle East for so long," said the bishop. Salpy Eskidjian, a former World Council of Churches staffer, now executive coordinator for the Office of the Religious Track of the Cyprus Peace Process, moderated the meeting. Speakers related how dialogue between different religious leaders in divided Cyprus has received significant assistance from Dr. Heiner Bielefeldt, U.N. Special Rapporteur on Freedom of Religion or Belief. At the meeting, Bielefeldt reiterated remarks in his most recent report to the U.N. Security Council in New York. "In Cyprus, the enhanced interreligious communication between Christian and Muslim leaders has led to recent breakthroughs, including the re-opening of churches and mosques that had been inaccessible for decades owing to the protracted conflict on the island," he said. The U.N. expert recounted how religious leaders have initiated emergency measures and cleaned up each other's places of worship, enabling an atmosphere of goodwill and trust. "Some interreligious encounters in Cyprus have been open to participation beyond the traditional religious communities, including Evangelicals, Baha'is, Buddhists and others, thus building awareness on the further emergence of religious pluralism," said Bielefeldt. Porfyrios, representing Church of Cyprus Archbishop Chrysostomos II, explained how dialogue "conducted in a spirit of goodwill, cooperation and sincere intentions" between religious leaders in Cyprus is now in its seventh year. He said that negotiations around Cyprus had gone on for 42 years between the leaders of the two communities to "reach a settlement of its problem by ending the island's division and restoring peace". "The peaceful coexistence of the Greek Cypriots, Turkish Cypriots, Armenians, Maronites and Latins is not some Utopia but the actual experience of our fathers and ancestors for many decades in our shared homeland." "Despite the difficulties...the dialogue among the religious leaders of Cyprus is making a significant contribution to the reconciliation and peaceful coexistence of the legal residents of the island." Porfyrios noted that unfortunately despite the best efforts the church had met with failure too. "We have failed so far in our attempts, which began in February 2015, to visit the churches of Saint James and Saint George, both of which are on the verge of collapse in the buffer zone in Nicosia," he said. Moderator Eskidjian noted that Muslim speaker, Dr. Talip Atalay, was the first mufti of Cyprus to establish a working dialogue with the Greek Orthodox Church on the divided island. "As the Mufti of Cyprus I consider myself lucky because of the privilege of being able to stand against all sorts of cruelty and violence together with four different Christian churches," said Atalay. "Together, we are standing against any violence whether it is to a mosque or a church." Atalay noted, like Bishop Porfyrios, "Achieving a sustainable peace on this island will not only be a political and religious model and example for the neighboring countries." He stressed the importance of establishing special institutions for resolving existing religion-based conflicts and also preventing future ones. Peter Weiderud, Director at the Swedish Institute Alexandria, Egypt, and also a former WCC staffer noted that with the Middle East at the center for the world's three monotheistic religions, dialogue is a necessity. This can entail engaging in dialogue with people viewed as enemies. "It is with the enemy that we make peace, not with friends," he said. "Before this dialogue both the mufti and the archbishop would have seen the other as extremists," said Weiderud while asserting that inter-religious dialogue is always promoting peace. "We saw this in Cyprus two weeks ago when we had a burning of a mosque outside Nicosia where the mufti and the archbishop stood up together with a common language to deescalate the tension. "Ten years ago this would have been a spark that would have set off a major fire," noted Weidrud. He argued that freedom of religion and belief can be an excellent opportunity to promote dialogue. The opening of the Church of Panagia Galakdodrofousas in Palekythro, in the Turkish northern part of Cyprus, after 41 years, in August 2015 was seen as a crucial reconciliation gesture on the divided island. The World Council of Churches hailed the opening of the church in the Turkish sector of the divided island as "an important sign of peace and reconciliation". Since the Turkish invasion of Cyprus partitioned the island, the northern third has been inhabited by Turkish Cypriots and the southern two-thirds by Greek Cypriots. UN peacekeeping forces estimate around 165,000 Greek Cypriots fled from the north to the south at the time of the invasion, and 45,000 Turkish Cypriots from the south to the north.